Both genuinely original and a smart physics puzzler, but aggravating in places, Mushroom 11 falls a few inches short of a classic. You've ridden minecarts in games before, but I'm betting you've never ridden one as a squirming fungal blob, its flanks clamped haphazardly around the sides of the car as it corkscrews through a hellscape of rusting pylons and lava. Likewise, you've probably crossed your fair share of crumbling rope bridges, but have you ever done so by squishing yourself flat to lower your centre of gravity, one appendage oozing tentatively out over the gulf? Mushroom 11's movement mechanics are a glorious, if occasionally maddening contribution to the lexicon of platform game design. They also comprise a gentle meditation on the survival of individuals versus that of the collective, with the 'protagonist' a culture in a couple of senses, surging and tumbling through the wreckage of our own. Mushroom 11 is a platform-puzzler that spans seven chapters in which you move by very carefully destroying yourself. The game's star, if that's the right word, is a colony of cells that grows rapidly to a fixed volume, providing it's touching something solid. Clench left mouse button and the cursor swells to an eraser brush, allowing you to shave away one side of the blob so that it expands, and thus travels, in the other direction, moulding itself around contours and absorbing nearby lifeforms (read: collectables) as it goes. You can also fine-tool the entity by picking away at it with a smaller eraser, and even subdivide it—obliterate one piece of fungus and the others will fatten up by the same amount. It's an unintuitive yet extraordinarily flexible system that serves as the basis for some great, original puzzles, plus a few clever variations on concepts from more traditional platformers. Crucial to most of these conundrums is the understanding that you are 99% expendable—as long as a single particle of the fungus survives it'll bubble back up to full size, like Dracula erupting from a drop of blood. A frequent gambit is thus to sculpt the entity into a gelatinous scaffold, easing nodules of fungus into crevices to anchor yourself while extending a tendril towards a ledge, only to lop away the tip and cheerfully sacrifice the remainder. There's real genius to how Untame has programmed the blob's ability to self-propagate—you have no direct control over the thing but most of the time it's clear which bits you need to kill off in order to grow in a particular direction. 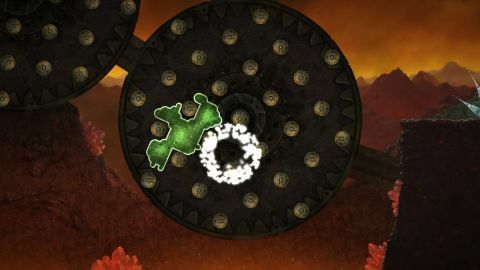 Where things get tricky, a little to the game's detriment, is with puzzles that involve moving mechanisms. These range from slaughterhouse production lines, trundling away gamely in the absence of their creators, through enormous gearwheels dotted with pegs you can wrap yourself around, to the bosses—freakish graduates of the Capcom school of design, all weaponised appendages, pattern behaviour and bulbous weakspots. Some of the more elaborate problems rank among the best you'll tackle this year. Some of the more elaborate problems rank among the best you'll tackle this year: highlights include weighting down a switch to drop a rolling hay bale, then carving yourself swiftly into a ramp in order to launch it at a stack of crates. Another scenario sees you clamping the fungus over the tip of a rocket in order to tilt it mid-flight, guiding the projectile through a gap in the roof. It's memorable stuff. But there are challenges later in the game that ask a bit too much of the means at your disposal, in which the fractious physics and the blob's unwieldy handling push the element of luck to the fore—a problem compounded by slightly punitive checkpointing, and the odd, Sonic-esque moment where you're given absolutely no hint of an imminent threat. You can't wipe yourself away completely using the eraser, thanks heavens, but it's easy enough to mess up when the pressure is on, plunging the blob into a toxic bath or accidentally brushing an electrified rail. And then there's the story, which I've left till last because the imports dawn on you quite gradually. The beautiful hand-drawn backdrops are layered with hints about society's fall—propaganda posters, underground nurseries, arid expanses of brick. The colour and complexity of human civilisation is everywhere, though a shadow of itself. You, by contrast, are a cuddlier version of the Borg, swarming across the benighted land and the few creatures that still inhabit it. The ending is benign, but getting there is a bittersweet process in which you play the part of both saviour and devastator—an emotive trajectory that delivers Mushroom 11 into the company of Braid and LIMBO, even as the mechanics of play call to mind World of Goo. It's a game that manages to be both amusing and solemn, without so much as a scrap of direct exposition, and while the difficulty steepens a little too sharply in the second half, it's a game you'd be foolish to miss.